For those under 16 years of age: This online boating safety course is approved by the Colorado Department of Natural Resources Division of Parks & Outdoor Recreation as a study tool for those persons required to take a proctored exam in a classroom setting (14-15 years of age to operate a motorboat). Successfully completing this exam will prepare you to obtain the Colorado Boating License. If you are under 16 years of age, you can use the course and exam as a study tool but you are not able to operate a motorboat or take the proctored exam until you are at least 14 years old. If you are 16 years of age or older, please click here! Graded immediately, review your wrong answers! 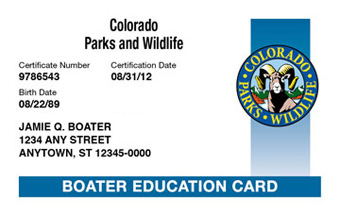 To receive your official Colorado Boating Safety Certificate, you must take a proctored exam in a classroom setting.